The ROSS THE BOSS Band unleashes the first wave of their upcoming "The Discipline Of Steel" 2017 World Tour with dates scheduled in February for Mexico and Central America. These initial dates will be followed by a European and United Kingdom tour during March and April, as well as confirmed European summer metal festival dates. The crusade begins with an initial run of four dates in Mexico, Guatemala and El Salvador, where The ROSS THE BOSS Band will co-headline two metal festivals, performing a classic MANOWAR set. 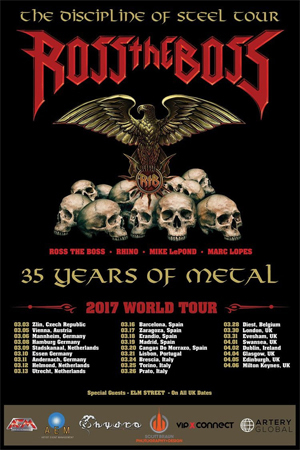 An extensive tour consisting of 26 dates in Europe are scheduled in March and April, including an iconic tour of England, where years ago, "Ross The Boss" Friedman began the metal onslaught in the fight against false metal. The earth will rumble and the momentum will continue through the summer and fall festival calendar. "Ross The Boss" Friedman (co-founder of MANOWAR) will be burning the fretboards on lead guitar, alongside bassist Mike LePond (SYMPHONY X); drummer Kenny "Rhino" Earl (ex-MANOWAR) and vocalist Marc Lopes (LET US PREY). "We The ROSS THE BOSS Band are so looking ahead to our concerts in sacred Mexico, Guatemala and El Salvador". We will bring the message of True Metal to our Immortal Metal Armies. I have assembled three incredible musicians, and together we will deliver an experience only to be described as, true classic metal. We are going to devastate every audience, every night, without mercy." For a ROSS THE BOSS VIP Experience, come meet Ross and the band on tour, go HERE.